H.J. 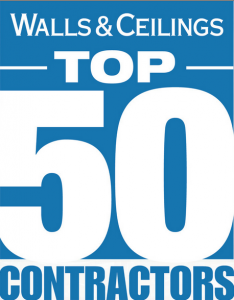 Martin and Son has been named to the renowned ‘Top 50 Contractors’ list of Walls & Ceilings magazine for the third straight year. Widely regarded as the leader in coverage of the walls and ceilings industry, the publication has generated its annual list since 2013. H.J. Martin and Son saw revenues increase 71 percent in 2017 over the prior year, due significantly to its work on the largest drywall project in company history, the new Marquette General Hospital in Marquette, Mich. Having begun late in 2016 with pre-fabrication work, it topped out with approximately 120 on-site employees and now is nearing completion. An even bigger drywall project, a new hospital in North Dakota, is on the horizon for H.J. Martin and Son as that work is expected to ramp up in 2019. The new Marquette General Hospital is a state-of-the-art, 500,000-plus square foot facility with 265 beds. H.J. Martin and Son handled a wide range of work on the new health structure, including Gypsum Drywall, Cement Board and Exterior Sheathing; Metal Studs and Framing; Tape and Finish; Sound and Thermal Insulation; Installation of Hollow-Metal Door Frames; Lead-lined Drywall and Radiation Protection; and Acoustical Ceiling Systems. The performance of the Walls & Ceilings division of H.J. Martin and Son on Marquette General Hospital has led to the company being awarded other substantial jobs, several of which are major projects in the Upper Peninsula of Michigan. Among them are the new Delta County Jail, work at Northern Michigan University and a Meijer superstore. Projects of the Walls & Ceilings division include medical facilities, office buildings, sports and entertainment facilities, retail, K-12 and post-secondary educational buildings, casinos and hotels. On the retail front, H.J. Martin and Son regularly handles Walls and Ceilings work for retailers across the nation.